Springtime is here, and that means it's time for a good spring cleaning. 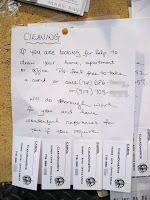 Local cleaning services are capitalizing on this seasonal sanitization, and here in Park Slope you'll find bulletin boards littered with advertisements to help you with your chores. It's odd enough when one ClEANING service uses a lowercase L within all uppercase letters to describe his business. But what are the chances that two competing services would commit the same fallacy? Before I let these chumps clean my apartment, I suggest they first clean up their act. 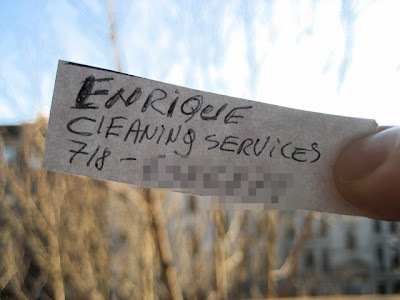 what about the lower case 'i' throughout ENRiQUE ClEANiNG SERViCES....REDiCUlOUS! It looks to me like a cheap attempt to get free advertising from your blogspace. I guess it worked. They slipped it by you!! Your blog is really funny....I enjoyed reading it. Why do people do that?! Mine is not so funny, but check out my blog if you want. interesting, ever concidered posting flyers for your cause? Wow, it really is unbelievable how many people do this. I don't get it. When I see lowercase L's in word with all caps, it just LOOKS funny. I find myself having to reread it, in order to figure out what it really says.